In my time, I’ve brewed a number of strong, hoppy American IPAs. Intensely citrusy hops, beloved by many brewers, present themselves in the forefront of a heady, heavy ale. After two or three, the effects are apparent: a general feeling of extreme relaxation, slurred speech, and unequivocal visions of splendor. These beers can take you down quick……Which is why, as of late, I’ve become interested in session beers. This leaves a lot of room for interpretation, but chief among the key words in this definition is “enjoy”. While I love a good 7.5% Imperial IPA, the high alcohol and aggressive hopping rates (hops, after all, have been used widely in traditional medicine as a sedative) of these beer can leave a person passed out on my couch faster than they’d care to be. I sometimes like to remember my entire drinking session, and too much of a good thing can ensure that doesn’t happen. There are several types of session beers that can be enjoyed throughout an evening, or perhaps an afternoon (summer is right around the corner!) without losing your wits. On tap at my house is The Magical Mild Tour, an amber-colored English Mild that tops out at 4.5% ABV. Dry yet complex, it goes down easily and won’t knock you to the floor like Mike Tyson (speaking of Mike Tyson). John, Great Fermentation’s fabulous brewing princess, has just finished brewing twenty gallons of 12 Penny Scottish Ale, a collaboration with Flat 12 Bierworks. It is a wonderfully sessionable brew, which is delicious and quaffable. Look for it on our kegerator soon! Two more session GFI beers come to mind as well: Wild Child Mild, a mild brown ale which features a range of specialty malts, and our Lawnmower beer, which is light, crisp, and refreshing. 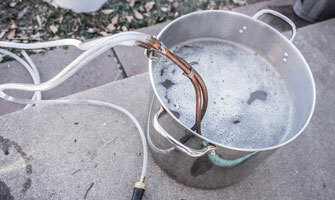 Session beers can be very easy to brew, but surprisingly tough to perfect. The results, however, are well worth it. You may even be able to write a blog post while enjoying several rounds of a quite sessionable beer that you brewed yourself.